Belt Technologies, Inc. produced a seamless stainless steel retaining ring for an OEM producing low-head hydroelectric turbines. Stainless steel conveyor belts by Belt Technologies, Inc. are excellent for vacuum chambers used in vapor deposition processes. High heat resistance and cleanliness make stainless steel conveyor belts by Belt Technologies perfect for heat curing medical adhesives. Belt Technologies engineers developed a solution using small-diameter drive pulleys to achieve linear motion for a 3D printer carriage. The engineers at Belt Technologies designed and produced a stainless steel conveyor belt for the transport of various products through a plasma treatment. Metal conveyor belts by Belt Technologies, Inc. are resilient to physical damage, making them ideal for transporting metal fragments in automated systems. 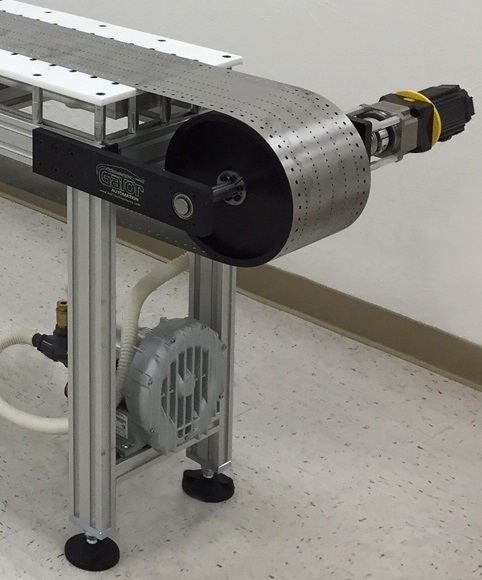 Belt Technologies produces a specialized metal conveyor belt for an automated disentangling device used in a clean room environment.